Scam artists have been using hacked accounts from retailer Kohls.com to order high-priced, bulky merchandise that is then shipped to the victim’s home. 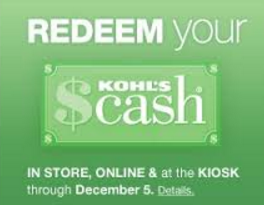 While the crooks don’t get the stolen merchandise, the unauthorized purchases rack up valuable credits called “Kohl’s cash” that the thieves quickly redeem at Kohl’s locations for items that can be resold for cash or returned for gift cards. KrebsOnSecurity reader Suzanne Perry, a self-professed “shopaholic” from Gilbert, Penn., said she recently received an email from Kohls.com stating that the email address on her account had been changed. Recognizing this as a common indicator of a compromised account, Perry said she immediately went to Kohls.com — which confirmed her fears that her password had been changed. On a whim, Perry said she attempted to log in with the “updated” email address (the one the thief used) along with her existing password. Happily, the thieves had been too lazy to change the password. Perry said she then contacted Kohl’s and gave them the two order numbers and the fraudulent email address. Turns out, the criminal wasn’t after the merchandise at all. Rather, the purpose of changing her email address was to drain the account’s stored Kohl’s cash, a form of rebate that Kohl’s offers customers — currently $10 for every $50 spent at the store. The two fraudulent orders yielded $220 in Kohls cash total, which is emailed once the order is confirmed (hence the need to change the victim’s email address). “Since the orders were being shipped to me, even though they were above the threshold for what my typical online spending behavior is, no red flags were raised on their end,” Perry said.